Texas, has become the top real estate hot spot in the state, and even a top tourist attraction. People are actually moving to Waco from California and New York, drawn by the show. One of the latest ventures for Chip and Joanna Gaines was the renovation of a property in downtown Waco for their primary business location which has housed the "Silos." The silos are a defining feature of the property and the entire downtown area. When the Gaines bought the property the city council asked them to paint the structure, but Chip Gaines asked that they be able to retain the original look, which fits in with their "shabby chic" look. The town leaders agreed and the silos remain with their original look. 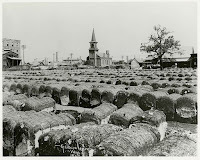 by the large buildings housing the cotton bales the slaves and land owners brought in for sale. By the late nineteenth century Waco had established itself as one of the most significant urban centers of the South. The town held the title of being the King of Cotton until the onset of the Great Depression. 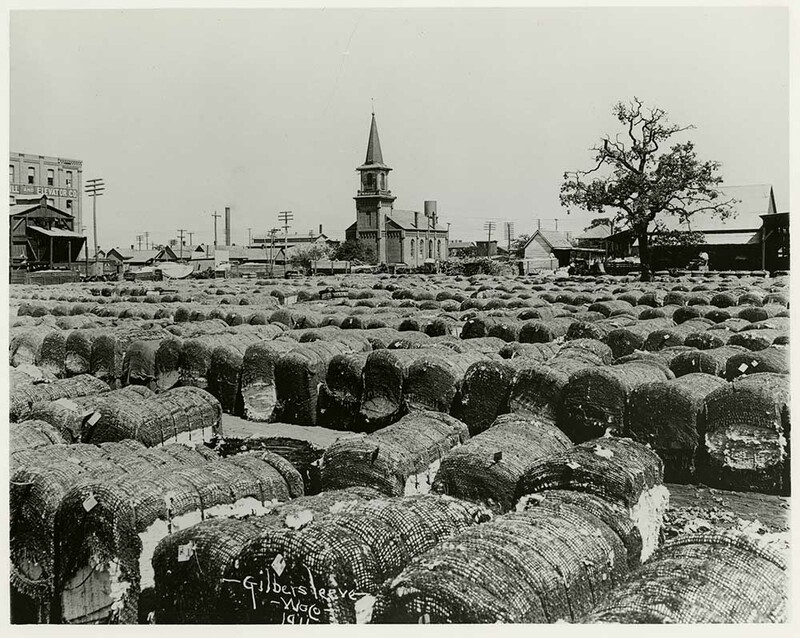 By 1900, cottonseed was second only to lumber as the most important cash crop in Texas. The state established itself as the leading processor of cottonseed in the nation and one of the largest suppliers of cooking oil, vegetable shortening, margarine and salad oil--by products of cottonseed oil. 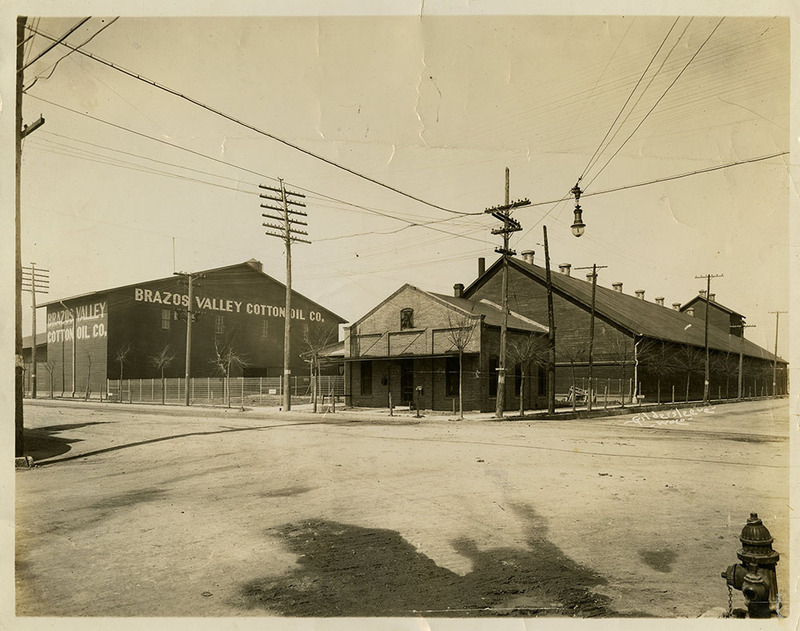 This locale was home to the Brazos Valley Cotton Oil Company beginning in about 1910. The company took truckloads of cottonseed from local gins and extracted the oil for industrial use, then sold the meal for cattle feed. Ask any Baylor student who attended the University until the 1960s, and they can quickly recall distinctive odor of the cottonseed oil being produced. The photo to the left is of the property before the erection of the silos. 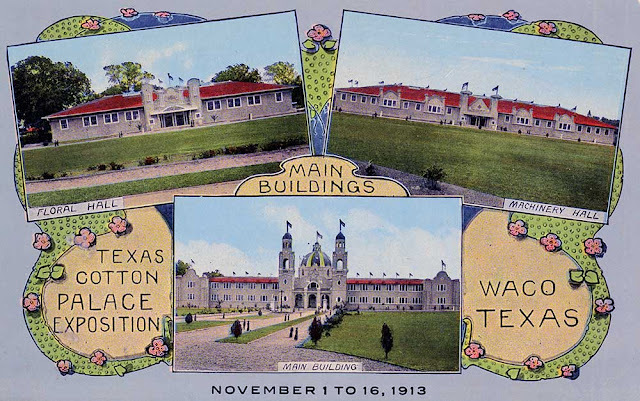 Because Waco was recognized as one of the nation's major inland markets of cotton after the Civil War, an exposition and fair was planned to be named the Texas Cotton Palace. A huge building was erected and the event was a success, but in 1895 the building burned. The event was not reactivated until 1910, and with great success. It was known as one of the biggest most elaborate expositions in the nation. Horse racing, concerts, art shows, livestock exhibitions and a variety of activities surrounded the event, crowned by the Queen's Ball, the social event of the year. It became a casualty of the Depression, but the event continues in the form of a pageant-type event every year in the spring on the Baylor University campus. That affair was just held a couple of weeks ago. So the next time I decide to go shopping down at Magnolia, or you see Fixer Upper on television, remember the rich history of cotton in our town. We love Waco, and we love Fixer Upper. Come see us in Waco! I love that show. Thanks for bringing the area's history to life, especially the silos' background. Thank you so much for this peek at Waco. I do love that show, and the Gaines's story. I've heard that they have been ridiculed by certain factions for the family-centric, Lord-loving tone of their show and their openness of their faith, and I'm glad that you chose to feature them here. Waco sounds like a nice place to visit. I do not know Chip and Joanna personally, but I do know her mother. They are a deeply devout family who love Jesus and want to be faithful through all of this success. It's quite a phenomenon for Waco and the surrounding area. I'm a devoted fan of the show too, Golden! 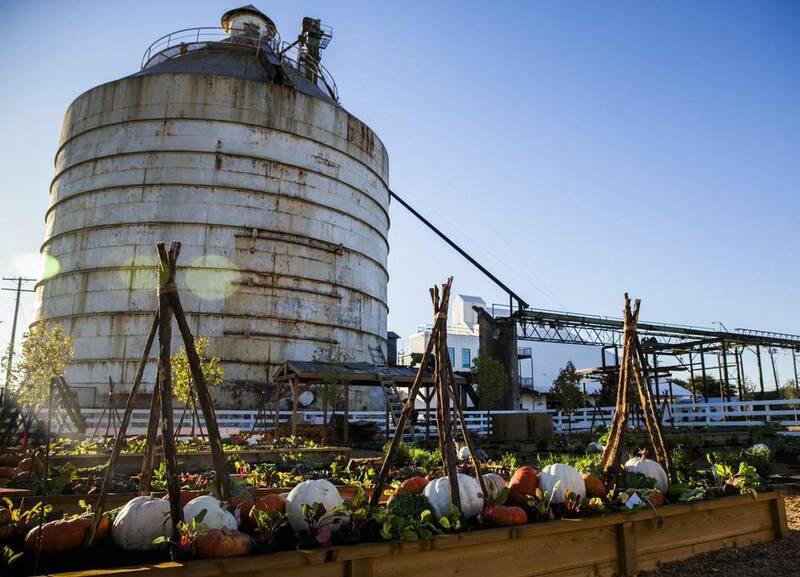 Thanks for sharing this interesting information about Gaines, Waco, and Fixer Upper! Golden, my husband and I were in Waco about eight years ago doing research for my Texas Trail books, and I don't even remember seeing the silos. I was too focused on doing research at the Baylor library, I guess. We really enjoyed the Texas Ranger Museum. If we return one day, I'm looking forward to visiting the Magnolia store. I love watching Fixer Upper. Chip's goofy humor reminds me of my dad's. Did you go up to the Texas Collection? They have wonderful historical information on the State. If you ever come back, please let me know! Would love to show you around! Oh, how I remember those silos from my Baylor days, and I remember the smells from the old gins. My dad graduated from Waco High School in 1933 and met my mother there. My oldest son and his wife live there now, so we're in Waco often including this past weekend for Baylor graduation. I wanted to go to the market, but Debbie said it'd be a mad house with so many people in town for graduation. I'm going back up there sometime in the middle of the week so she can take me. We watch the show and love Waco since I have so much family history there. My mom was baptized as a pre-teen at Columbus Ave. Baptist church, and my dad's family were long time members of First Methodist. Wow, Martha, you have some deep roots here in our fair city. We love Waco. So many good churches, good people, things to do. Waco is also where the inventor of the soft drink Dr Pepper lived and concocted his famous drink. Dr Pepper was the name of his horse. Until recently his house and barn were owned by David Crowder, the famous Christian singer. He and his wife rehabbed the inside and it is gorgeous. Right up there with Joanna Gaines. A state of the art music studio was built in the old barn. I have no idea if the new owners still have that music studio but the house is a show-stopper. I've seen pics of the interior. That's exactly right, Pam. The Dr. Pepper Museum is another interesting attraction in our city. I don't know what the new owners of David Crowder's music studio have done with it. Come visit! I LOVE the Fixer Upper and the Gains family! Thanks for sharing the history of Waco, Golden!